YANGON — State Counselor Daw Aung San Suu Kyi welcomed the latest ex-military man into her cabinet on Thursday after the Union Parliament approved a former Air Force colonel as the new minister of the Office of the Union Government. 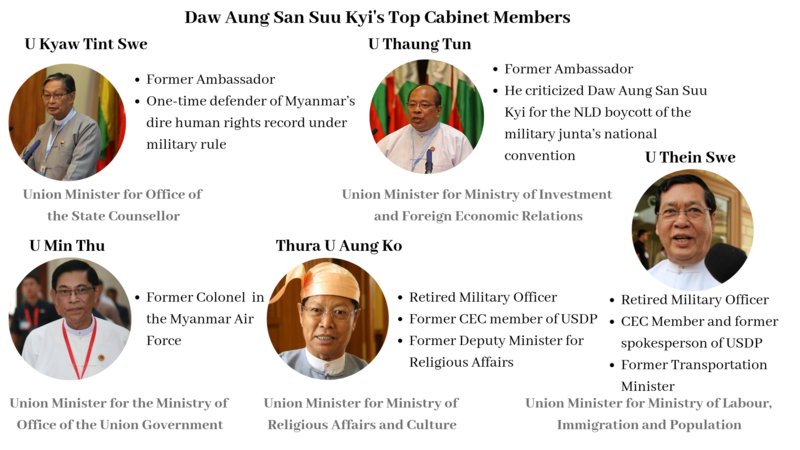 With U Min Thu’s appointment, six of Myanmar’s 25 Union-level ministries are now headed by former or serving military officers, with portfolios ranging from security to religion. 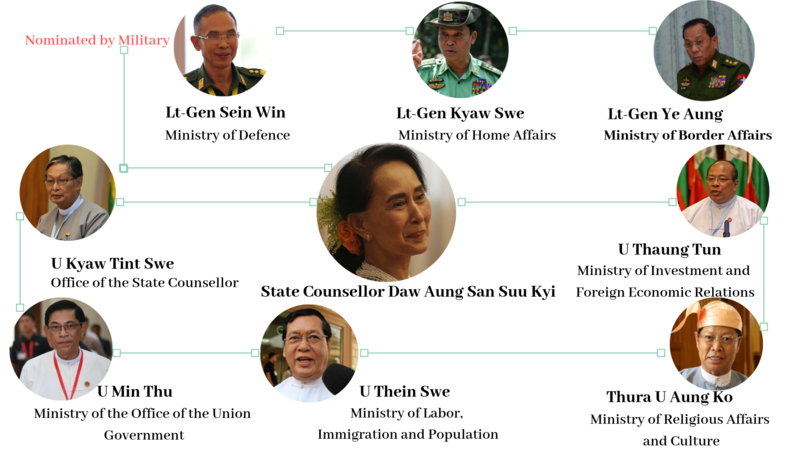 Since the National League for Democracy (NLD) took office in early 2016, many have wondered whether the party has enough senior leaders with the skills and experience to run and fix a country slowing emerging from decades of misrule by the military. Thanks to the Constitution it drafted in 2008, the military still gets to appoint the ministers of defense, border affairs and home affairs, which oversees the police. But the NLD has struggled to fill the rest of the cabinet, often turning to former civil servants and even a few military men. Besides the three ministers appointed by the military itself, ex-military officers are now running the Ministry of the Office of the Union Government, the Ministry of Religious Affairs and Culture, and the Ministry of Labor, Immigration and Population. The NLD has also appointed two people who were loyal to the military during its time in charge to head two other ministries — U Thaung Tun to run the Ministry of Investment and Foreign Economic Relations and U Kyaw Tint Swe to run the Ministry of the State Counselor’s Office. The former criticized Daw Aung San Suu Kyi in the early 2000s for her party’s decision to boycott the military regime’s national convention in 1995. The latter used to defend the military regime at the UN over its human rights abuses. Despite some criticism of the picks, Daw Aung San Suu Kyi has never publicly explained the reasons for her choices. Some observers suspect they’re meant to placate the military as she nudges the country toward democracy. Others say she simply couldn’t find any qualified candidates within her own inner circle. 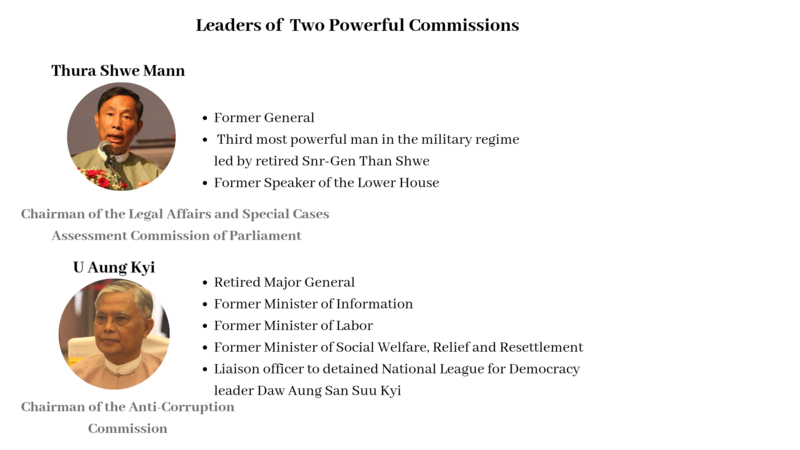 Beyond the cabinet, the NLD has also appointed ex-generals to lead two powerful commissions, one to review the country’s existing laws and another to fight corruption. Daw Aung San Suu Kyi appointed Thura U Shwe Mann as chairman of the Parliament’s Legal Affairs and Special Cases Assessment Commission, whose review remit includes the Constitution. The former general was considered the third most powerful man in the military regime of Senior General Than Shwe. Before the 2015 general elections, he was purged as chairman of the military-backed Union Solidarity and Development Party in a power struggle with then-President Thein Sein and later branded a traitor for allying with Daw Aung San Suu Kyi. The Anti-Corruption Commission is headed by U Aung Kyi, a retired major general and former minister of information, of labor and of social welfare, relief and resettlement. He also served as liaison officer to Daw Aung San Suu Kyi while she was under house arrest during the military government. Many government departments are also still being run by former or serving military officers.